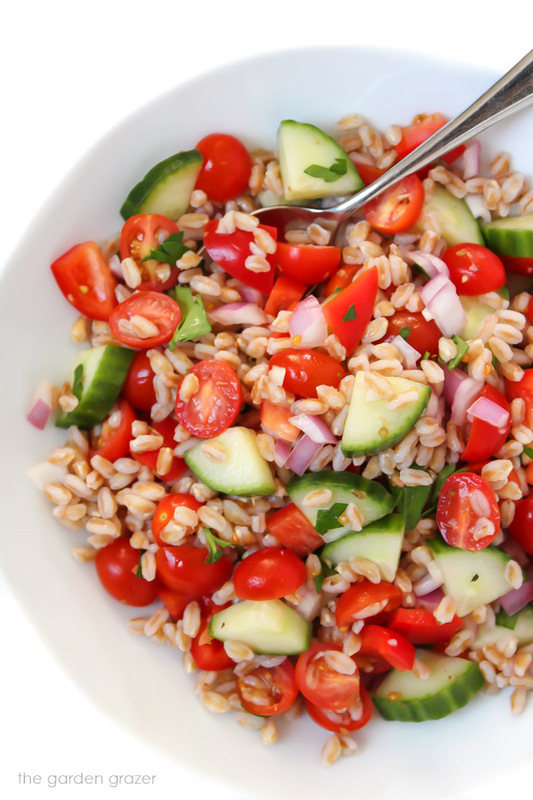 This easy, healthy Greek Farro Salad is just 10 ingredients and 35 minutes to make! Vegan, oil-free, and great made-ahead for picnics, potlucks, packed lunches, etc. 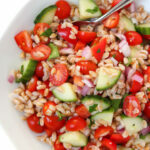 But I quickly realized I have zero farro recipes on the blog and needed to change that. So I adapted this recipe from my Ultimate Greek Chopped Salad which I love oh so much. Basically I swapped out the garbanzo beans for farro, added some fresh herbs, and updated the dressing. I LOVE this remake! Plus it takes just 10 fresh, healthy ingredients and only 35 minutes to make. So it’s a great choice for packed lunches, picnics, potlucks, or simply a make-ahead meal to keep in the fridge for the week. (And if you’re an olive lover, they’re fantastic in this!) Enjoy! As always, come join The Garden Grazer on Instagram 🍓 and share a pic if you make this! I really love seeing what you guys cook up. 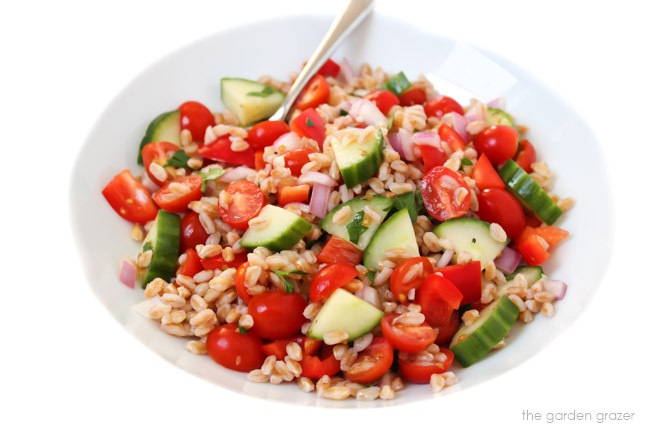 Easy, healthy Greek Farro Salad is just 10 ingredients and 35 minutes to make! Vegan, oil-free, and great made-ahead for picnics, potlucks, packed lunches, etc. Cook farro: rinse well and add to a small pot with 2 cups water. Bring to a boil. Cover, reduce heat to med-low and simmer for 25 minutes or until desired tenderness. Drain. Meanwhile, make the dressing: mince garlic and combine all ingredients in a small bowl. Set aside. Halve tomatoes, finely dice red onion, and dice cucumber and bell pepper. Roughly chop parsley. Place in a large bowl. 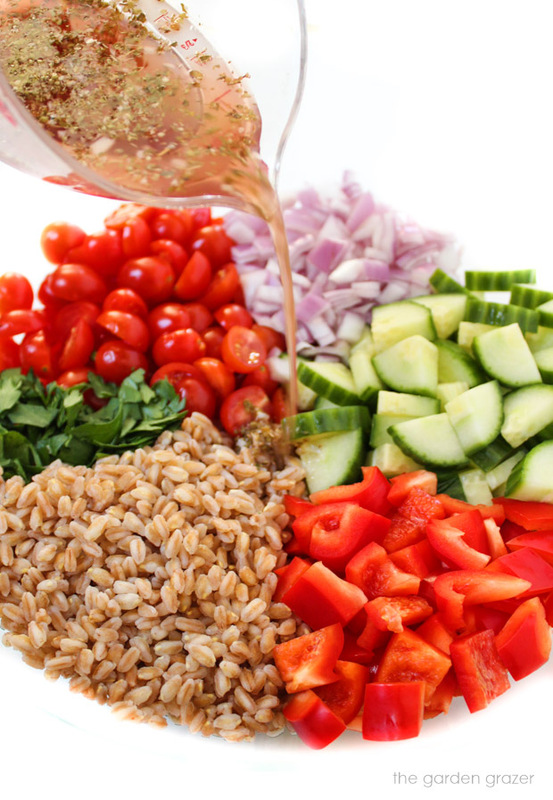 Add drained farro, dressing, and stir to combine.